In the residential real estate arena, some home buyers are quite inexperienced while others are knowledgeable and experienced in the home-buying process. Most residential real estate agents help novice and experienced clients with home purchases. Yet, even the most experienced client is likely to have less home-buying experience and knowledge than the professional real estate agent. Consequently, as the Keller Center Research Report audience knows, the agent plays a crucial role in framing and shaping the home-buying experience for the client. How clients make sense of the plethora of information in the home-buying process takes us into an area of research called information processing, a cornerstone of consumer behavior. Consumer behaviorists have been hard-at-work studying how consumers attend to, process, and use information sources, because scholars need to understand how consumers process information in order to understand consumers (Hoyer and MacInnis 2010). The outcome of the information processing process - making a decision, buying a product or service - is of keen interest to scholars - and practitioners. Researchers have been working in this area for well over 100 years. The classic five-stage consumer behavior model (problem recognition, search, evaluation, purchase decision, and post-purchase evaluation) underpins thinking in business and the academy (Solomon 2013). In addition, the consumer's buying process intersects with a salesperson's or agent's selling process. Processes or routines play an important role in guiding and directing the behavior of both parties. In this article, we focus on how the real estate professional creates and manages a home-purchasing routine that works well for the buyer, whether novice or experienced. Research suggests that routines result from the interactions of those involved in the exchange. That's not surprising. However, consider this. When the interactions between individuals (buyer and agent) and the information transmitted (buying criteria, for example) are clear and intentional, a strong routine can emerge (cf., Bapuji, Hora, and Saeed 2012). Strong routines are more likely to evoke expected responses than are weak routines. help clients move toward successful purchases. And, we propose that the changing nature of information sources in residential real estate may be weakening routines in ways that are not necessarily obvious to the real estate professional. To effectively assist a prospective home buyer, the agent needs to understand the buyer's needs. In the home search process -- pre-Internet -- the agent sat down with the prospective home owners, engaged in a discovery process, and developed a list of buying criteria. At the close of the discussion, the agent would summarize for the home owners what she heard and gain agreement that these criteria would drive the buying process. As the prospective home owners and their agent visited homes, both parties would "update" their criteria based on the prospective home owners' feedback on each house. Since there were fewer other information sources available to the home buyer prior to the Internet, the routine that emerged surrounding the buying criteria was most likely strong and consistent. The agent had direct interaction and engagement in the buyers' process. The result: the strong routine became an integral part of the process, making information processing easier (i.e., reduced cognitive complexity), decreasing uncertainty, and improving the overall buying experience for both parties (Becker and Knudsen 2005). Today, after buyers spend a house-hunting day with their agent, they may return to their residence or hotel, and spend time using on-line sources to "look further." Buyers may identify new criteria and discuss the elements that they, perhaps as a couple, are willing to "trade off." The challenge for the real estate professional is that this conversation happens off-line...at a time when the real estate agent is not present or privy to the unfolding conversation. The buying criteria may be changing. The historical approach or routine for understanding the prospective home owners' buying criteria is weakened. "What additional information have you [and your spouse] considered? [THEN], As a result, in what ways have your home-buying criteria changed?" It is crucial for the real estate professional to establish a new routine for learning about, updating, and confirming the client's buying criteria. The new routine, first and foremost, acknowledges that the buying criteria are fluid. In fairness, the buying criteria have always been fluid for the home buyer but, in the advent of additional information sources, the buying criteria are less transparent to the agent. Secondly, the new routine must embrace the fact that the buyer is engaged in the buying process outside the presence of the real estate agent. As a result, the buyer is "different" each time s/he meets with his/her agent. By engaging with other information resources outside the presence of the real estate agent, the buyer is updating and changing his/her buying criteria and, in essence, changing who s/he is as a buyer. Third, by incorporating a new routine or process whereby the agent asks the buyers about the new information and changed buying criteria, this explicit approach makes the invisible visible to the agent. Additionally, by driving the conversation about the changing buying criteria, the real estate agent stays in the center of the buying process with the prospective home owners. Academic research on routines in the area of hotel services provides some additional perspective on how agents can drive stronger routines (Bapuji, Hora, and Saeed 2012). In their research on routines, they explored the opportunity to use physical cues (non-human actors) to reinforce the verbal messaging surrounding a hotel service. As we extrapolate from their work and consider the implication for the residential real estate industry, we propose that a physical cue surrounding the updating of buying criteria will strengthen the routine even further. Each time the real estate professional engages face-to-face with his/her clients, the agent can hand the client a buying criteria status report (on a paper or digital format). That form would summarize the current buying criteria (to the best of the agent's knowledge) and be easily updated by the prospective home owners. The updating of the form would be completed in concert with the conversation resulting from the questions: "What additional information have you and your spouse considered? In what ways have your home-buying criteria changed?" How information is managed in the home-buying process is important. We have dedicated this entire issue of the Keller Center Research Report to the subject of information processing. 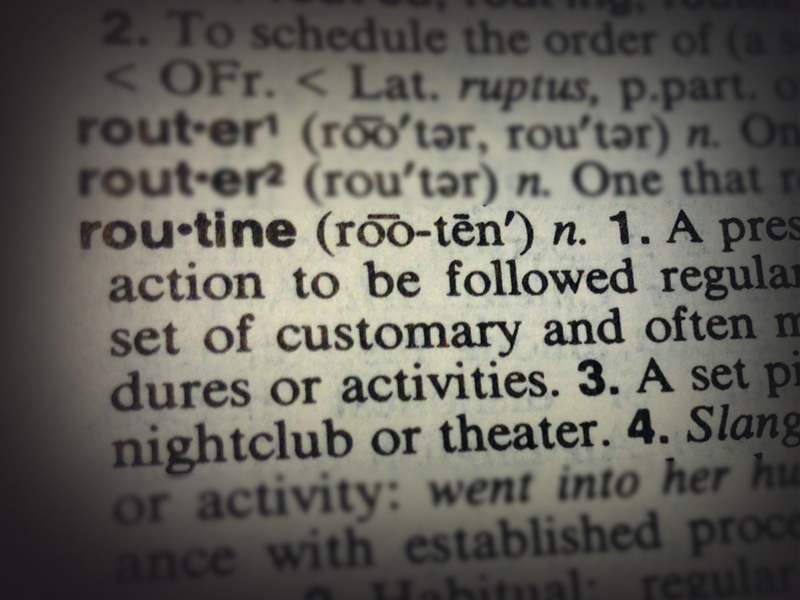 Routines are an important part of how we, as human beings, make sense of and manage our complex world. The home-purchasing process is complex for the novice and experienced home buyers. Professional real estate agents who develop a strong routine surrounding the process of understanding the home buyers' changing buying criteria will stay in the sweet spot of the process with the buyers. Encouraging the buyers to discuss and update their buying criteria with each interaction will also assist the buyers in managing the complexity surrounding the home-buying experience. Bapuji, Hari, Manpreet Hora, and Akbar M. Saaed (2012), "Intentions, Intermediaries, and Interaction: Examining the Emergence of Routine," Journal of Management Studies, 49 (8), 1586-1607. Becker, Markus C. and Thorbjorn Knudsen (2005), "The Role of Routines in Reducing Pervasive Uncertainty," Journal of Business Research, 58 (6), 746-57. Hoyer, Wayne D., and Deborah J. MacInnis (2010), Consumer Behavior, 5th Edition, Kentucky: Cengage Learning. Solomon, Michael R. (2013), Consumer Behavior, 10th Edition, New Jersey: Pearson Publishing. Dr. Andrea Dixon (PhD - Indiana University) has an industrial background in research, planning, and advertising, her research interests embrace behavioral issues related to sales, service, and client satisfaction. Andrea has published in the Journal of Marketing, Harvard Business Review, Organizational Science, Journal of the Academy of Marketing Science, Leadership Quarterly, the Journal of Personal Selling and Sales Management, the Journal of Satisfaction, Dissatisfaction and Complaining Behavior, and several other journals. In 2002, Dixon's research published in the Journal of Marketing was selected as the award-winning research in the sales area. Prior to joining Baylor, Dixon was the Executive Director of the MS-Marketing Program and the Ronald J. Dornoff Teaching Fellow at the University of Cincinnati. She has co-authored the book, Strategic Sales Leadership: BREAKthrough Thinking for BREAKthrough Results, and multiple industry-wide research texts. Dixon serves on two editorial review boards and co-chaired the American Marketing Association's 2007 Winter Educator Conference. While serving as a faculty member at the University of Cincinnati (U.C.) and Indiana University-Bloomington (I.U. ), Dr. Dixon taught an array of graduate and undergraduate courses. One of U.C. 's MBA EXCEL Teaching Award winners, Dixon was selected for a national teaching award by Irwin Publishing, as a distinguished professor by Indiana University MBA students, and for a university-wide award by her academic colleagues at I.U. In 2008, she was named the Academy of Marketing Science's Marketing Teacher Award winner. Prior to teaching at U.C., Andrea worked closely with GAMA International as the Senior Director of Product Development and Marketing.